Had my aerial moved from a chimney stack that is being removed and moved to the back of my home, Gareth came and fitted a new aerial to my room, and the lounge and the attic room, all work was completed clean and tidy and with a professional manner, very friendly everything working great. A couple of weeks latter I had to call them as my TV was not getting a signal, I completed the return call form and within minutes on Sunday evening Clive called to arrange for Gareth to come round the next day. Gareth returned and managed to rectify the problem within the hour again very friendly and helpful. Phoned these guys up with a tv signal problem today, I explained my problem, Will, who I think heads up the business, explained what the problem may be, and he would get to me when he could. Within an hour the guys were here, sussed out the problem, and charged me as per telephone quote! How can anyone complain? Great service, and not ripped off. I wish these guys all the best, Thankyou will and gaz. I have used this firm on three occasions now. Latterly to install CCTV. I cannot praise them highly enough. The best service by the best lads using the best technology and equipment. There was a slight hitch but Clive was on it in a flash and sorted it. Just for the hiccup Clive installed a TV aerial for free. I could write an essay on how impressed I am with Accrington Aerials. Would definitely recommend and use again if needed! Extremely impressed, thank you guys for coming so late on to sort my parents BT box and sorting the signal booster out so that they can receive freeview in all other rooms. Would recommend to anyone who asks. My husband called them on Tuesday and they were able to fit us in on Thursday. Very professional, polite, knowledgeable young man arrived and was able to give me the present of Xmas TV. We had previously been unable to get any signal here on Buckshaw Village so had to watch TV using Now Tv apps over the internet … not ideal and not much choice. So thanks Will for doing a great job at fitting us a new digital aerial! Highly recommend. My dad recently bought a new tv and on the box it said it did everything bar make him a brew, Him being allergic too new technology has meant that he has spent the last few weeks following the instruction book that I think was wrote for tiny fairies with university degrees in ‘ setting up technology ‘ and swearing that much I now think their dog thinks it’s name has changed too ‘ boxxxcks ‘. Anyway b4 the TV was chucked through the window or worse my dad was by his wife who by this point was planning on how too murder him and bury him with the dam telly. I rang Clive who having known him (and the family) from school and seeing him build this business from strength too strength knew he would be able too help dad and julie, and he did – well his team of lads did. Both dad and julie told me when I spoke too them earlier that when the lads arrived they were friendly, polite and the second they stepped into their front room both lads removed their work boots as too not tread the wet miserable rain inside and got on with the job. They quickly set it up and had it working as it should be so my dad is now as happy as a kid at Christmas and Julie is happy that it’s finally done and dad will now stop bloody messing. 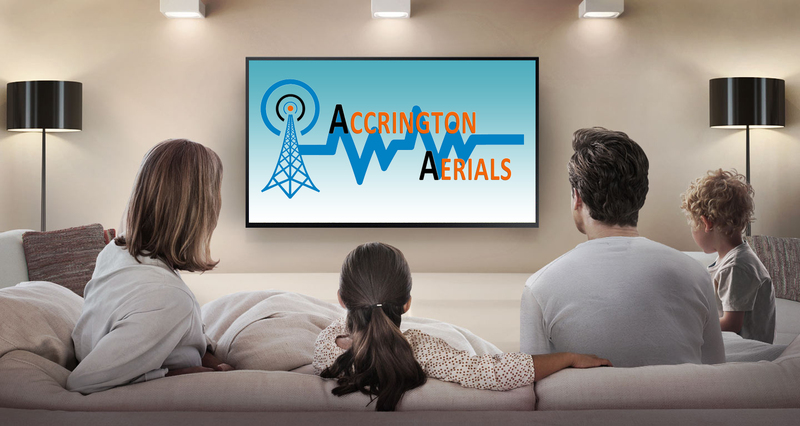 Accrington Aerials were super. We were thoroughly impressed with their service. We rang them to enquire about our TV not receiving a signal in our new house, and they said they’d come and have a look free of charge in a few minutes! They arrived and checked to see if the aerials were working, and they weren’t. They suggested buying a Freesat box because we had satellite cables, and they knew the signal was poor where we live. They had excellent knowledge of the area, and saved us hundreds of pounds by being honest and telling us installing an aerial would not be a good idea, and that a Freesat box was much more sensible. They also did not charge for coming to the house and advising us! The guys also took their boots off at the door. Top service, polite, friendly and honest help. Recommend them to anyone.